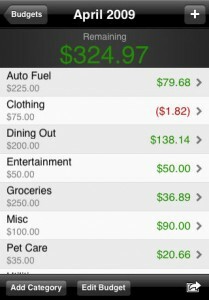 Budgee was a simple personal finance application I wrote for the first iPhone. It went live in October 2008. It was one of the first 10,000 apps1 in the Apple App Store. The premise was simple. First, you defined a list of budget categories. Then, you set a target budget amount for those categories. After that, you entered your actual expenses as they happened. As you depleted the money in a category, it let you know how much you had left in your budget. It also supported exporting transactions2, used regional currency formats, and many simultaneous budgets. Budgee was an app I wanted since I bought my first iPhone. When I saw the WWDC keynote announcing the “real” app store3, I knew I had to build it. I bought my first Mac, a black MacBook, and got to work. It took a while to build. Objective-C was surprisingly different from any language I had used before. After a few months, I finished the app, submitted it to the App Store, and away things went. Budgee was a big success to me. It didn’t make a ton of money, but it did more than pay for my MacBook. On top of that, it was a great experience building & supporting my app. It was fantastic to get emails from people who loved the app. After 11 updates over 2 years, app usage trailed off as the app store grew. The amount of money I made from the app wasn’t enough to justify the effort to keep maintaining it. It cost $1.99 and it was just a one time charge. If it sold a ton, the story would be different, but in the end, it only sold around 1500 copies. The app needed more time for development & support than I had. In July 2010, the last update went live in the store. Even though it didn’t look modern anymore, the app was still used, so I wanted to leave the app as long as I could. It reached a point that iOS had advanced so far, that the app simply didn’t work on new devices. The effort required to update it was monumental, so I pulled the app from the store in September 2013. In the years since, I’ve learned a lot. I know more about software development, personal finance, and business. I’ve also started a family. All these things brought new thoughts & perspectives that didn’t exist for me back in the early days. I’ve also tried nearly every budgeting/personal finance tool out there. The problem is, none of them help me manage my money the way I want it managed. There are plenty of great apps4 that may or may not work for you, but at the end of the day, they just don’t work for me. Building a new, more modern Budgee has been on my mind since 2010. I’ve had so many things going on in my personal and professional life that it just didn’t happen. I finally have enough time, resources, perspective, and desire. It’s time to begin the process of building the Budgee system I’ve always wanted. My plan is to create a series of blog posts documenting my progress as I go. I enjoy reading dev blogs of programmers I admire. I thought this will be a nice way to give back while also creating some level of accountability. Even if no one else ever reads this, I know I’ll enjoy looking back on it one day. It’s going to take some time, but this will be worth it! Not too long after I posted this, I discovered that the app I’ve been using for the last several years (YNAB) was going to be updated with a web based version and lots of new features. The new version of YNAB launched about a month ago and it includes nearly all the features I wanted for a new version of Budgee. One of the features the desktop YNAB didn’t have that I really wanted was the ability to schedule transactions and then see those future transaction totals for a given category while budgeting for a given month. The schedule transactions do show in the budget view in the new YNAB and everything else works very similarly to what I envisioned for Budgee. Due to this, I have decided not to continue Budgee development at this time. If it turns out that YNAB won’t work for me longer term, I’ll revisit this decision. So far, the new YNAB seems like a winner.